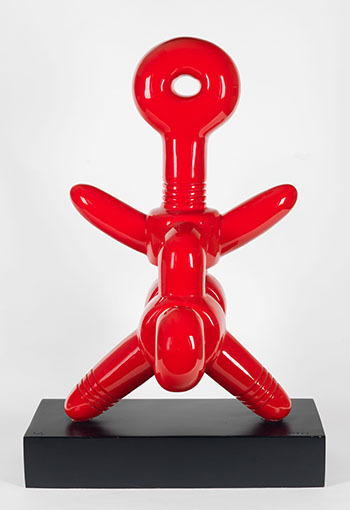 In 1963, Sorel Etrog immigrated to Canada, and within a short period of time, he established himself as an important artist in the Toronto contemporary art scene. He had been linked to the European avant-garde between the wars and was also influenced by antiquities while studying at the Brooklyn Museum. During his four years of study there, he was inspired by its magnificent collection of primitive art, including Cycladic terracotta votive figures and African fertility goddesses. 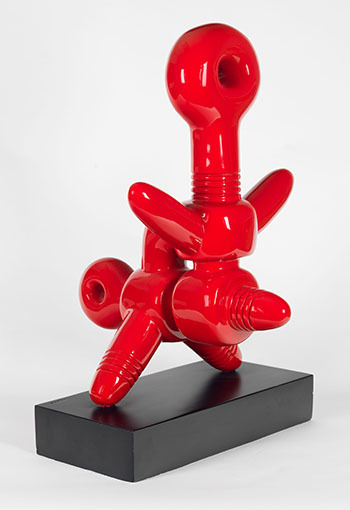 Sadko is from Etrog’s Screws and Bolts series, first inspired by an eye screw that Etrog picked up on a Toronto street. Sadko fuses the sensual art of ancient civilizations with the mechanics of the machine age, in a thought-provoking and modern sculpture. Like the 1927 German film Metropolis, it challenges us with the implications of the mechanization of humanity. 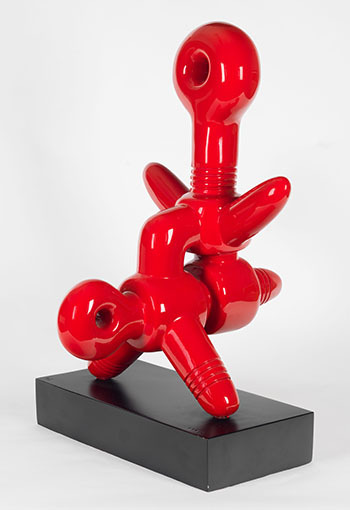 Etrog’s use of hot red automotive paint adds another element of sensuality to this vital and emphatic sculpture. Both this work and the large version were produced during one of Etrog’s sojourns in Florence in the early 1970s, when he worked with the Michelucci foundry in Montecatini. The base measures 15 3/4 x 7 1/2 x 2 7/8 inches.